There’s something really dodgy going on with the Dom Post’s reporting of the subject though. No doubt you may have read about the Option X project in the Wellingtonian, or the Capital Times, and Scoop has been taking a major role in getting publicity out there on this project, but the Dominion Post seems to have been rather quiet on the subject. Quiet to the point of being completely mute perhaps? They’re happy enough to feature local content when it is about something as relatively unimportant as a 3m high sign at the airport – which, let’s face it, is a silly idea but is hardly going to cause the city to grind to a halt. But the DomPost seems to have a disdainful approach to the groundswell of citizen opinion on this project which seems to be quite clearly saying that they don’t want a flyover. Perhaps then, they may take some interest in this: not one flyover, but two? I’m unsure how likely this is, but comments from people at one of the public meetings organised over the Basin proposals noted that it is not 100% ruled out either. It seems that, buried somewhere in the depths of the NZTA documentation on this project, mention is made of a possible two way route through the “Buckle St corridor”, which to you and me, means that at some distant stage in the future, traffic could flow eastwards as well as westwards. Yikes. I can’t find the source reference – but it got me thinking – what if? 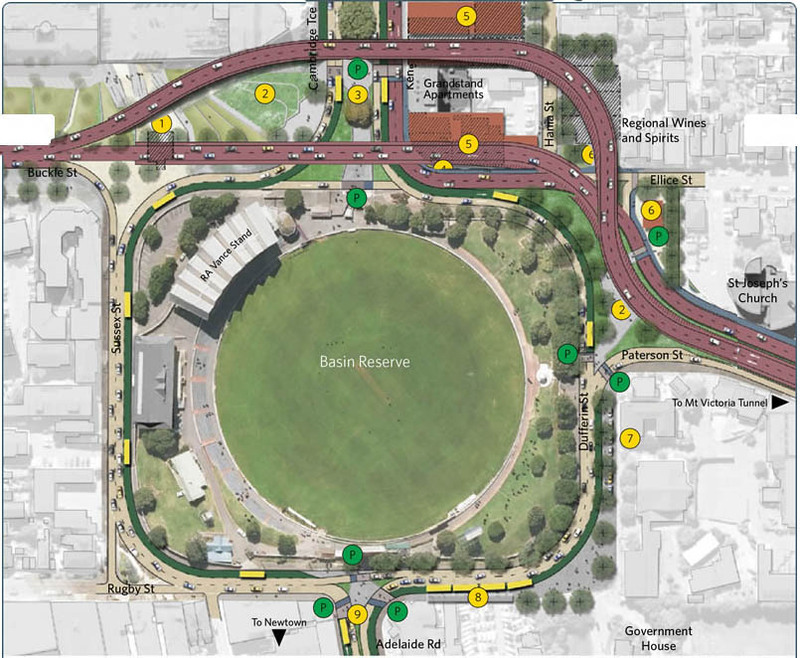 Apparently no image exists of the proposal, just a footnote in some words – about the possible building of not just Option A flyover, but Option B as well. So, in an effort of citizen goodwill, I bring to you the pinnacle of my poor photoshopping skills, where I’ve mashed up A + B and produced – well, not C, nor X, but its an unholy mess that’s for sure! Wouldn’t want to be in the Grandstand Apartments there I tell you! Nor, really, would I want to be anywhere under it. The whole thing is an economic diaster. Who ever heard of starting a project when for every dollar you put in you only get 50c benefit! And this does not even take into account (as far as I can ascertain) all those people in Hatatitai who will have an increased trip time when they try to get into the city via Goa Street. Or for that matter the slowed down public transport bus system that will have to get through Hataitai. As for two way through Buckle Street this is dreams of transport engineers. Kind of hard to do a good job of it when you have a new baby seamonkey at home (i.e. no time or sleep). Let’s hope they don’t ignore the public. I’m not holding my breath though, as I do love oxygen. Max, I’m all for two flyovers (heck why not three), but can let’s reroute the second flyover away from that other important instituion: Regional Wines. I like Option X in concept… it is very clever. But I would like to hear what motorists are supposed to do to compensate for the missing movements. I’d also like to see a version that included a west–>east direction road along the bypass route. Did anyone else go to see the Sport Centre today? I did and I think it is brilliant. Huge well lit spaces and soft boundaries between playing spaces and spectator areas. The vast rood is very cool. My only criticisms are that the coloured exterior cladding around the entrance is plasticky and tacky, and there is a bit too much tarseal around the exterior. They could have done with some paving and some more garden. Sea monkey – congrats on the little sea monkey. I remember when I was a Kidd that all the comics used to have an advert on the back for sea monkeys – a little king and queen with smiley faces, living under water – and al you had to do was buy a packet full and add water. I’m guessing that real sea monkeys are a little more difficult to breed than just adding water? David P – yes, the new Indoor Sports stadium is a fantastic structure isn’t it. Strange that both our stadiums are named after banks – they’re the only companies that still have money to throw around I guess. What are the front runners for nicknames do you reckon? The Limpet? Stingray? Or something cake tin related : the Baking tray perhaps? “All that’s left for the opening, on August 27, is for the centre to be named. This is important. The Westpac Stadium is blighted by the absurd Cake Tin moniker. Already some have suggested the Kilbirnie centre could be called the Kilbirnie Crate, Starship Enterprise or The Limpet. The opportunity to give the stadium an appropriate name must not be lost. Initially the thought was that it might be named after a Wellington sports great – but from which sport? The centre will host an array of sportsmen and women from many sports. On reflection the most appropriate name for the complex would be the Kerry Prendergast Sports Centre. Can we call associated traffic jams “The Kerry Prendergast Traffic Jam” as well?